Leap year has a special meaning to our family. It means that my husband has an actual birthday. Yes, he was unfortunately born on the 29th of February and only has a real birthday every four years. Nevertheless, we still celebrate it every year. His family was not big on birthdays and they hardly celebrated his when he was growing up. To compensate, I always make it a point to have a cake for him on his special day. He has a sweet tooth and he loves cakes. Last year, I made him a pandan macapuno cake which he loved so much. 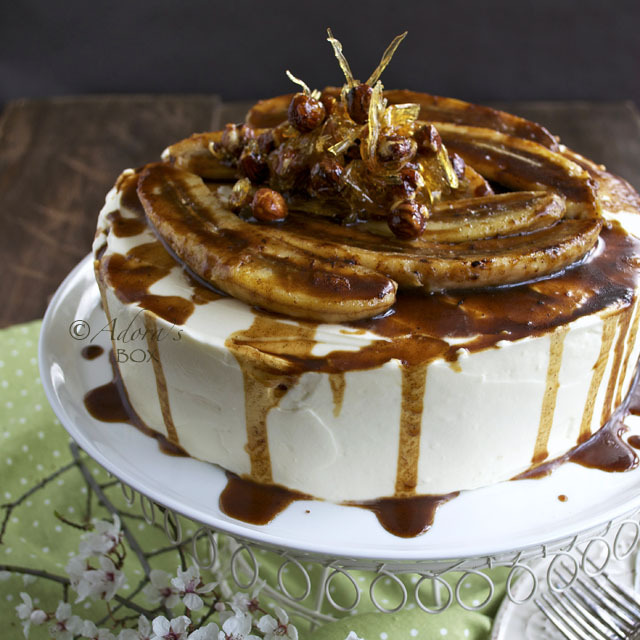 This year's offering is a rum banana and hazelnut cake. 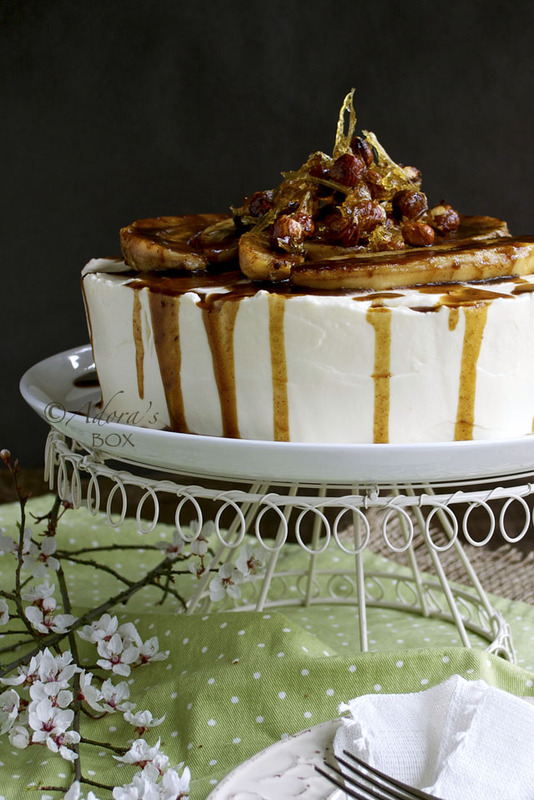 This cake was inspired by Martha Stewart's caramel banana cake. 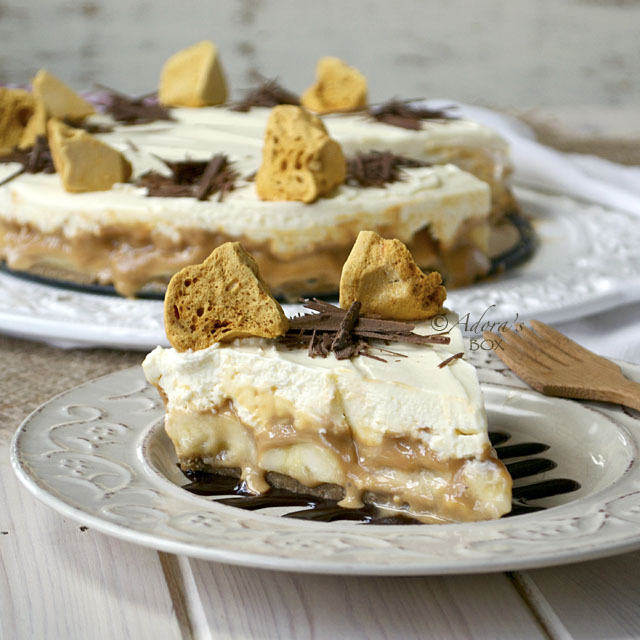 Caramel and banana is a match made in heaven. It is so much loved in the far East as it is in the West. 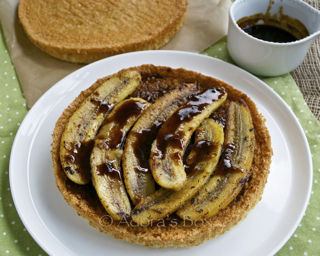 Simple caramelized bananas is a dessert or snack that is appreciated everyday. I chose to use a hazelnut sponge for the layers instead of banana cake like Miss Martha's because I want a contrast between the filling and the cake. I filled it with rum bananas and wrapped it up with a cream cheese frosting. It was simply delightful and of course my husband liked it. Line 2-9" cake tins with baking paper. Whisk the eggs, sugar and vanilla together until pale, thick and fluffy, for about 3-4 minutes. 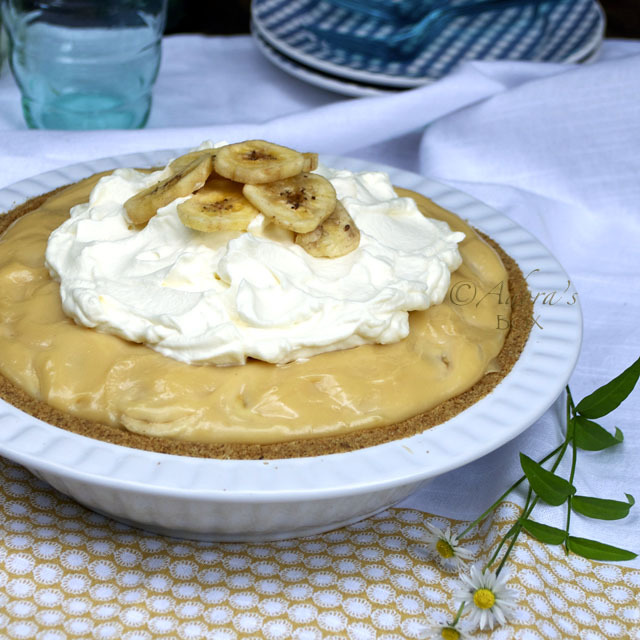 The mixture should leave a lasting trail when drizzled on its surface. Whisk the flour and hazelnuts together in a mixing bowl. Add to the egg mixture. Fold in carefully with a large metal spoon just until combined. Pour into the prepared pans and even out the surface with a palette knife. Bake for 20 minutes or until the top springs back when touched. The bananas should not be over ripe otherwise it just melts when fried. Peel and split the bananas lengthwise. Heat up a frying pan and put 2 tbsps. of butter. Fry half the bananas on high heat until medium brown and starting to soften, about a minute on each side. Do not overcook. Transfer to a dish and fry the rest of the bananas in the remaining butter. 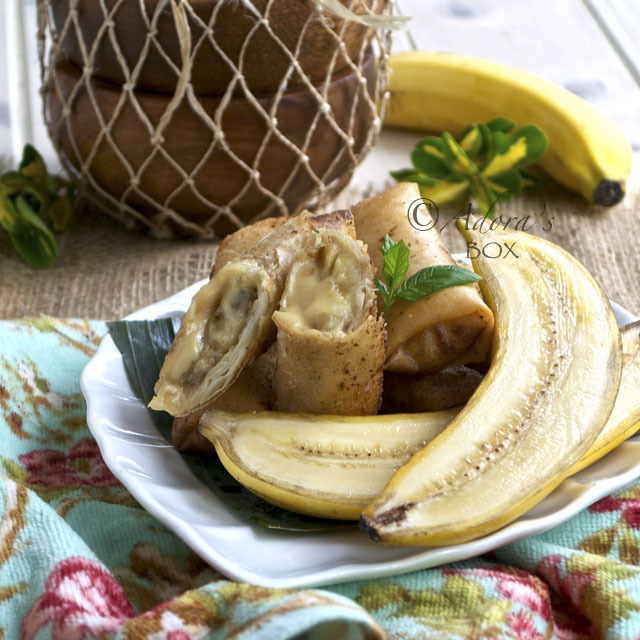 Set the fried bananas aside. Discard the remaining butter left in the pan. In the same pan, add the sugar, cinnamon and rum. Bring to a boil and simmer just until the sugar melts. Transfer to a bowl and leave to cool. 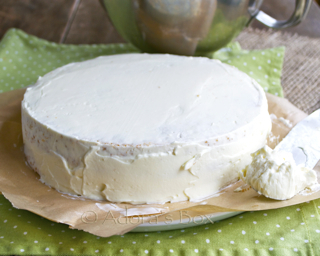 Whip the cream and sugar until light and fluffy. Add the cream cheese and whip again. Brush one of the sponge bases with 2 tbsps. of the caramel syrup. Line half of the bananas on the cake. Drizzle another tbsps. of the syrup on the bananas. Top with the other sponge base. This is a new thing I've learned from Miss Martha: frost the top and sides thinly, then refrigerate for 30 minutes. This is called the crumb coat and makes a neater finish to the cake. Frost top and sides with the rest of the frosting. I have simply iced the cake with a palette knife because a down home cake like this doesn't go well with elegant piped icing (this is what I say when I'm lazy to pipe the icing). 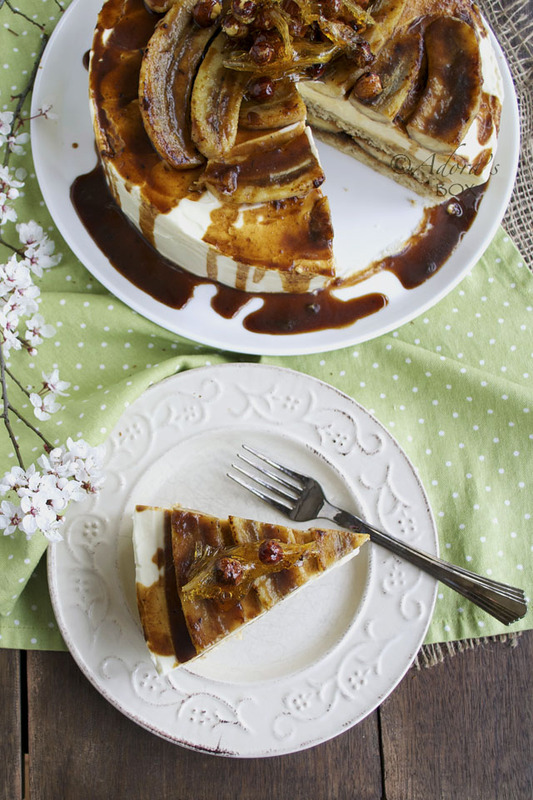 Arrange the remaining banana slices on top of the iced cake and drizzle with the rest of the syrup. I have also added candied hazelnuts for decoration. Put the water and sugar in a pan. Stir on low heat until the sugar melts. Increase the heat and swirl the pan gently until the syrup is caramel coloured. Add the hazelnuts and gently stir. Pour into an oiled tray. Pull the hazelnuts to separate while still warm. Stunningly delicious! Oh before I forget.... Happy Birthday to your husband! =)I am still in awe looking at your pictures. And the cake looks just divine.. Happy birthday to your hubs Adora. I'm sure he loved this... OMG he should... I mean look at that cake! I want a slice right now. Oh holy cow!! 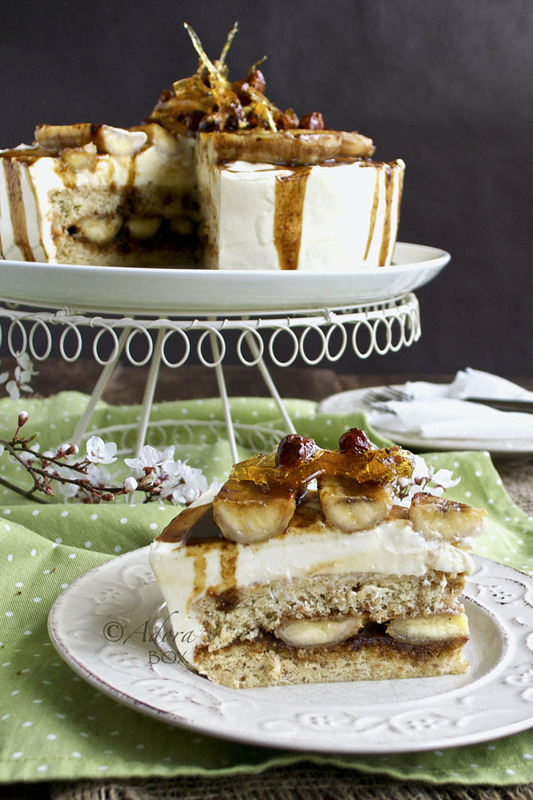 This is incredible!I am definitely gonna start layering bananas in my cakes now! WoW!!! great cake,you did an awesome job.love your photos. Fantastic cake for a very special birthday! I love that you make a cake for your hubby every birthday. I wish I had your baking and decorating skills! I'm not a cake person, but this cake looks irresistible! That cake is a work of art! It is absolutely gorgeous!!! And I totally think your husband deserves it, having a real birthday only once in four years... You are so talented and your husband is a happy man, for sure! this is the most amazing cake you have ever made, and quite possibly that I have ever seen! Happy birthday to your hubby and this cake is absolutely stunning! Happy Birthday to your husband! Wow, Adora... you did it again. LOVE IT! Want to eat this!!! Thanks for all your greetings for my husband. They made his birthday more special. We all enjoyed the cake. I hope you all get to try the recipe sometime. Yum!! Lucky hubby. I love bananas, and this looks incredible. So do you usually celebrate on Feb. 28 or March 1 during the odd years? This just looks too good! Absolutely beautiful!